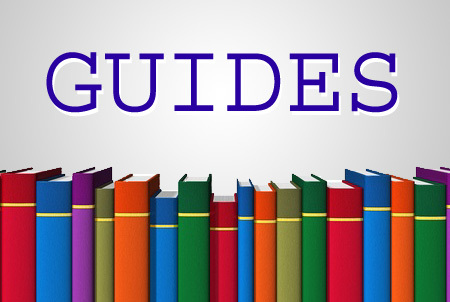 “Buyers should have complete information about an item’s location so that they can be aware of all the costs associated with purchasing the item. The item location must be clear and accurate. 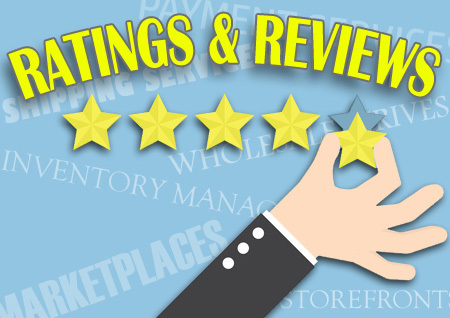 It’s not clear why eBay UK felt the crackdown was needed now and not before this time, but the company said it was grateful for the feedback it had received from the seller community. Secondly, eBay UK will be reviewing international sellers who state their item location is in the UK, but have excessively high dispatch times resulting in extended estimated delivery dates. 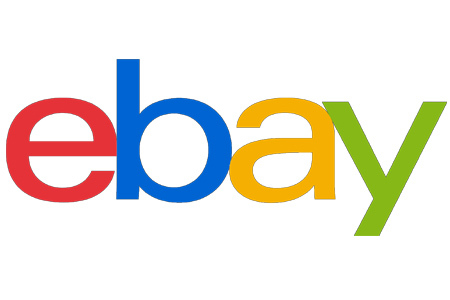 “Our teams overseas continue to work directly with international sellers on policy education and enforcement to ensure compliance,” eBay stated in Thursday’s announcement. Below is an excerpt of the policy’s examples of what’s allowed and not allowed in seller listings. When will that be rolled out to the U.S.? I’m really sick of seeing the item being located in California, while the seller information indicates he/she is registered in China (including delivery taking weeks, and feedback stating “quick shipping from China”). As bad as California is its hard to believe that 99 percent of the chinese sellers live in california. I would think that they would be smarter. probably will never see this on the u.s. site as the ceo loves the chinese sellers. I think the next CEO will make some changes to this as hopefully the next CEO will not be in bed with the Chinese government like Wenig is. While I understand the concern from buyers about the stated country being incorrect (customs fees, delivery estimates, etc. could be an issue), how could eBay possibly know where the item is located? For example, the post office that services my zip code is a complete disaster. The last time I shipped from my own zip code was several years ago. I shipped three items. One took several weeks to be delivered (it was only supposed to take 2 or 3 days) and the other two NEVER LEFT THE POST OFFICE! (insurance claims were paid out for the two lost parcels) So, I always drive a little further to go to a post office that’s halfway decent. I enter my “item location” as the zip code I MOST OFTEN ship from. However, I do not ALWAYS ship from the same post office. If required, I could change my item location to the “actual” item location, which is my home address. But if eBay thinks I’m going to be shipping from that zip code, they are sorely mistaken. I have the same situation regarding post offices, and we come under the “no harm, no foul” rule. 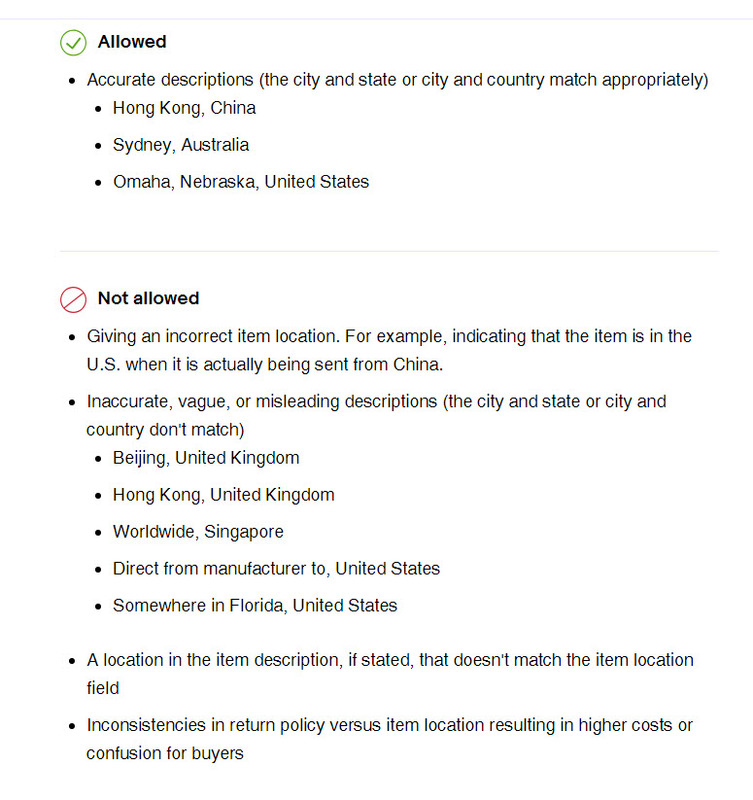 This policy (not in the U.S. yet) is to protect buyers from sellers who represent their products to be warehoused in the same country as the eBay site, yet are not. So they know when they are buying from an international seller vs. a domestic seller. Or if a seller is one location, and having returns sent to a different location. These practices present problems for buyers, and for eBay in trying to mediate the process if something goes wrong. Also prevents shipping charges from being wildly different than expected due to location. This can happen when the seller is represented to be on one side of the country, and the product is shipped from the other side. If you are shipping from the next town over, or on your way to work, no one will care. There is no drastic difference in location, so no alarms will be set off. I live in a town with a stupid name which is actually a direction. As several other towns in the US have the same name town, I guess it isn’t unusual. However, I had a buyer very upset to find out that she couldn’t pop into her car to come to MY HOUSE to pick up her purchase. I only lived 8 hours from her! I nowhere indicated that I sold out of my front door. Even so for the area that she thought I lived in, she would have spent more in gas (these were the days it was around $4/gal) to come to pick it up than having me mail it. I just couldn’t understand why she was so upset when she hadn’t been promised a pickup. This was an eBay order. Another time someone on a forum took me to task for not putting my town in the spot for my town and instead gave a direction. Another seller who saw the post first ‘defended’ me and explained that it WAS my town name. I could just imagine what eBay could do with it now! I know I don’t like not having any idea of where a seller might be located at as it makes for a quick way to judge what shipping times might be. For eBay to put this new policy into practice in the UK, things must be truly disastrous over there. eBay really needs to crack down on this problem over here in the US. As a seller on eBay, I live in a small town near Buffalo NY so I simply put Buffalo as my item location. So I agree with Chester — a small difference like that isn’t going to matter. However, when I purchase an item, usually from California, and THEN notice there’s an extended arrival date of 2 to 3 weeks, I know I’ve just been taken by another tricky Chinese seller. It’s THESE sellers that eBay should go after.